Okay, remember our discussion of “The One” a couple of weeks ago? You know, where Sara was talking about “the one” zucchini bread? Well, I have been on the quest for “The One” coleslaw–the one to rule them all–for as long as I’ve been cooking. You know, the one for potlucks and piling atop sandwiches and for snacks at 2:00 in the morning. Basically, I wanted a fabulous classic, southern-style coleslaw that I could make at home; I didn’t want caraway seeds or vinaigrettes or strange veggies. Just something akin to The Colonel’s, only better, and not in a red and white cup. I kept running into the same problem: none of them were flavorful enough. And then I’d try tweaking them and wind up with too much salt or too much vinegar or too much of something that doesn’t belong in coleslaw, used in a desperate attempt to remedy Cider Vinegar Gone Wild. Okay, peeps, this is rocket science. Combine mayo, mustard, vinegar, sugar, salt, onion, and celery seed. In a large bowl, combine shredded cabbage, carrots, and green pepper. Toss with dressing and refrigerate for at least 2-3 hours and up to about 3 days (or when it’s unjustifiably soggy). Try this out with these perfect Pork Sandwiches! This looks like a Coleslaw I could live with! Especially on top of a yummy bbque pork sandwich–served on a crusty roll. Can I eat this for breakfast?? My husband tells me he doesn't like cabbage and doesn't like mayo but he loves coleslaw. Whatever! I've never found a recipe that I've liked but this one looks just perfect. I know your pain. I have a grand daughter that doesn’t like nuts or chocolate, but eats Nutella everyday for breakfast. What’s up with that! Looks great! Just wanted to let you know that I'm doing a post on my blog to brag about how AWESOME your blog is!! I have a link, hope you get a lot of new visitors! 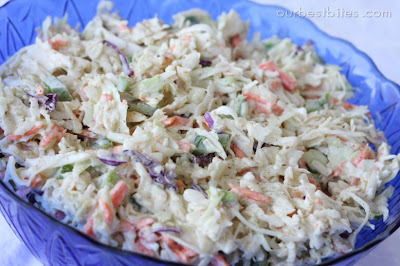 I've been needing a good coleslaw recipe…this looks perfect. Thanks! Denissa- you're awesome! Thanks girl! Just made this a few hours ago to go on top of my BBQ shredded chicken sandwiches and OH MY it is delicious. Thanks so much my friend! YUM. I wanna eat it plain (and plan to) and lick the bowl (might do that too). So guess what? I didn't know I liked coleslaw! I guess I've only had it at cheap-o restaurants and school cafeterias so after a few bad experiences I don't have a very good opinion of it. But I gave this one a shot today and it was SO good. I loved that it wasn't overly sweet like a lot of them are. It was so good in fact that I rushed out and bought some pre-made pork so I could make the pork sandwiches! I'm pretty sure it's my new favorite meal. YUM! Finally made this the other night and let me tell you it's my new favorite coleslaw! Delicious!! I'm really not a big coleslaw fan, but my husband is and I thought I'd try this to go with our pulled pork sandwiches. I couldn't believe how much I loved it. Like, it was my favourite part of the meal! Now I'll be making coleslaw all the time and poor hubby will have to share. Thanks! So, I think I may have said this before — but, you're blog is awesome! I love to cook and tweak recipes, but I seem to find myself not messing with yours because you've already tweaked them to perfection. Totally making this recipe to go with BBQ beef sandwiches and baked beans this week. AMAZING! Even my coleslaw hating husband was piling this on top of his BBQ Pulled Pork Sandwich. So yummy! I never like coleslaw… until now – Sooo good!! I always stop at your blog first when looking for a recipe! About how many do would you say this serves. I want to make it for my son and daughters cowboy/cowgirl birthday party this weekend and we have 45-50 people coming. P.S. I love you girls, you have THE BEST recipes. Ever. Can't wait to get my hands on your cookbook!! I made this coleslaw to compliment a pulled pork sandwich. However, it did not go over very well. My guests found that it had way too much celery seed. If I were to make it again, I would cut back the celery seed by half. Interesting comment about the celery seed. I had the opposite experience. We had a cookout Saturday and the coleslaw was almost gone before the BBQ. It was great on the pulled pork BBQ. However, the quantity of cabbage I used was more so it may have effectively cut the amount of celery seed per serving. Instead of a bag of pre-shredded cabbage/carrots, I bought a head of cabbage (so cheap) and ran it through the food processor. I threw the carrots, bell pepper, and an onion through the processor too since it was already dirty. The cabbage came out to about 3 lbs so I doubled the ‘sauce’ recipe (5 tsp celery seed). Since the original recipe called for a 16oz (1 lb) bag of cabbage, technically I should have tripled the sauce recipe, but I didn’t want the cabbage swimming in liquid. Doubling it worked out just right. If you like math, I tripled the cabbage but only doubled the celery seed, so I really used 2/3 the amount of celery seed the recipe called for. I also added 1 tsp cayenne (in my doubled sauce) and it was just right. I threw away my old coleslaw recipe and replaced it with this one 🙂 Thanks Kate and Sara. I love this recipe! I made it for over 30 people at my daughter’s birthday party and I’m making it again for an Oktoberfest potluck tomorrow. What a quick and easy dish that comes together beautifully, full of flavor and fast! I think the issue with the celery seed is a personal preference, what may be too much for some, may be just enough for others. I use 2 tsp and think it tastes great. This was great! I used 1/2 the celery seed and didn’t add the carrot or bell pepper (none on hand) and it turned out great. I brought it to a family fish fryb& it got rave reviews! Thanks! I used this recipe for a St. Patty’s Day birthday party last year with corned beef sandwiches and never did I believe it would be such a HUGE hit! I will be making this every St. Patty’s Day. Of all the wonderful recipes and ideas on this site that my family likes, I have to say this coleslaw recipe isn’t one of them. With the mustard in this dressing, it tasted more like a potato salad dressing on the cabbage. My family did not like it at all. I spent most of my life in the midwest, have ate several times in Memphis, never had coleslaw flavored like this. I appreciate all the work you put in this site, and most of your recipes are great. But this one……not a fan. Some things are just best left unsaid, no? Sheesh lady. First recipe I’ve found that is almost identical to the one my father used to make. A lot of restaurants leave out the onion and sugar – a must have for good slaw! OOoooh, I am on the lookout for “the one” as far as coleslaw is concerned too! I will give this one a try, thank you very much for posting! Using mayo and making it not too sweet is a MUST for my coleslaw. I’ll be trying this version very soon! This is such a great website. You do a fantastic job with the photos!!! Are today’s recipes in your book, or are they new? They sound new, but just wanted to check! Keep posting!! Nalley light mayo is the only I have found that tastes like regular mayo. It doesn’t taste fake. This coleslaw was a HUGE hit!! I used canola mayo and replaced the sugar with some splenda. It is so NOT easy to keep my girlish figure! Thank you for posting this recipe. Yum! OMG. I made this for tomorrow. I just tried it after the flavors had time to mingle. It was SOOO good. I shouldn’t be surprised, I’ve never tried a recipe of yours that I didn’t like. Beats me why people think this is so good. I had to make coleslaw for a family picnic and tried this the day before. It is the yuckiest coleslaw that I have ever tasted. Even refrigerated it overnight thinking that it might taste better the next day. Nope. Ran to the grocery store at the last minute and bought their coleslaw which was 10 times better than this. celery seed is not the same as celery salt. Opps, a bit too salty . . . wish I would have noticed that before I put in the 1/2tsp of table salt. Best coleslaw…I always gets TONS of compliments on it. Even my husband, who is not a “creamy salad” kind of guy, loves it! Tried this recipe when I realized I did not have any white vinegar (my “regular” recipe). This is now my favorite. Made it 4 times so far. Always great. I had some cabbage to use up and decided to make coleslaw for dinner. Found this wonderful recipe on Pinterest! It’s a savory, thicker dressing, not a sweet nor thin one, and it’s delicious! I’m so glad I found you! Go ahead and consume the regular mayo without remorse. I heard someone say this last week “low fat products are a chemical s*** storm!” Truth. I wouldn’t repeat it, except that I totally agree! this is my family’s absolute favourite coleslaw receipe…even the picky ones eat it! This is seriously the BEST coleslaw recipe – EVER! And I’m not a huge coleslaw fan. 😉 I made it today to go with some BBQ pulled pork sandwiches, and I could not stop eating it right out of the bowl! I thought the celery seed amount was absolutely perfect (for my tastes anyway). This one is DEFINITELY going into my “The Best…” recipe file!!! 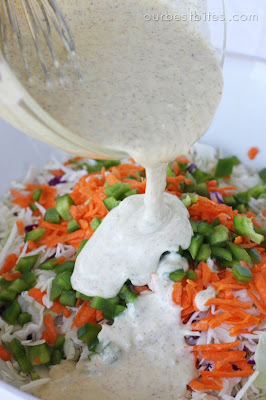 My new go-to slaw dressing!! Tweaked it a bit, probably added a bit more Dijon, 1 1/2 tbs sugar, 1/2 tbs celery seed, no bell pepper, but, wow! Sure was yummy. This is a keeper! Thanks for sharing! I made this tonight exactly and followed the recipe exactly. We ate it with pulled pork sandwiches. My family and I agreed it was the BEST coleslaw we have had! Delicious, and I too… could not stop eating it out of the bowl! Thanks for sharing! We’ve made this several times now. I have been halving 1/2 the recipe, since the first time made so much. Like others, I am not a big cabbage fan and didn’t grow up eating slaw. My grandmother made me eat hers once, but haven’t got the recipe. We have this one added to our book. And again today we made another batch. Ladies – Hosted a n’hood party tonight and served this slaw; generously piled high in pulled pork sandwiches w/pickles. Thanks to you, I am a hero in my kitchen, but you ladies deserve all the credit. Bravo to you – keep up the great work!! Need to revisit this recipe again. I’ve been making this one for almost a DECADE! It is absolutely my favorite. If I’m in the right mood, I can sit with a bowl of this instead of a bowl of ice cream. The only correction is I call it “slaw” (southeast US) and it goes on my BBQ (which is pulled pork).